The Seniors Drop-in Day Centre operates from Monday to Friday, 9am to 5pm, with various activities such as bingo, arts and crafts, chair-gymnastics, games and entertainment, in addition to the exquisite lunch provided daily at our accessible facilities, taking into account the dietary needs of our members. The First Portuguese School, in partnership with the prestigious Camões Institute, provides Portuguese language programs throughout the city. Under the guidance of our lauded Principal Ms. Celina de Melo, our qualified teachers instill pride in our heritage while helping students achieve their goals in a fun, productive environment. Classes are open to adults, and children from pre-school to grade 11. Our fantastic Summer Camp program for children and youth runs from the beginning of July to the end of August. The program has been designed by our teachers and Early Childhood Educators, and features wonderful activities such as: science experiments, sports, visits to parks, cooking, water activities, and more! Our Summer Camp also provides valuable mentorship opportunities to 8 co-op students/year. English as a Second Language courses; CELPIP preparation, and Citizenship classes are offered in the mornings and evenings. Basic computer skills are taught during the week, in the mornings and afternoons. Lessons include learning to use the Microsoft Office suite, and how to effectively surf the internet. Our welcoming staff is here to help newcomers with an array of services which include: filling out passport and immigration applications, providing information about community resources, interpretation services, resumé writing, and much more. Join us on Tuesdays and Thursdays at 7pm for Zumba fitness classes, and dance to keep your health in shape! Nourish your mind, body and soul by attending our Yoga classes on Fridays at 7pm. 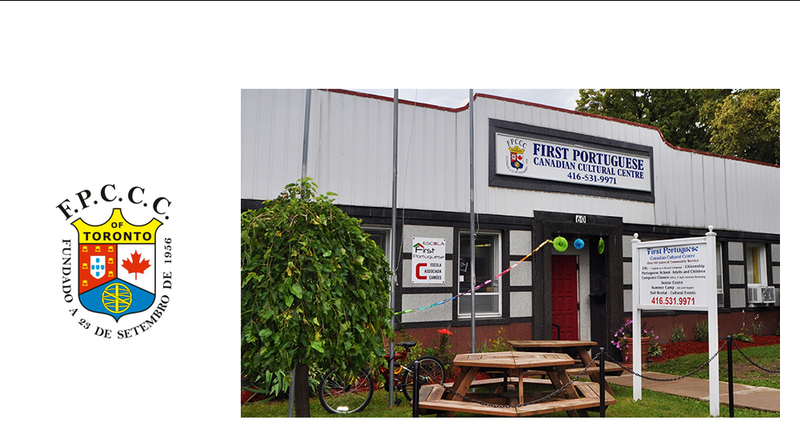 Come and support the First Portuguese Canadian Cultural Centre! The FPCCC regularly seeks volunteers to assist on different programs, which help us improve the community. Students and adults welcome. Suitable for a wide variety of events and special occasions, our hall has a capacity of 120 people, and is available for rent on weekends. For more information, please go to our website www.firstportuguese.com or call (416) 531-9971.